ClarinetFest 2014 started to wrap up on Sunday afternoon with a marvelous performance by the Festival Choir, consisting of many eager performers who were registered for the conference. Students, professionals, and aficionados alike all took the stage to form one of the largest clarinet choirs seen at the conference this year. Conductors Mitchell Estrin and Raphael Sanders were warm and friendly with both the audience and the choir, and the variety of music performed was sure to leave everybody with a new favorite piece. The choir opened with a commission, Paul Basler’s Dr. Boda’s Magical Spinning Machine. Professor Estrin mentioned that the work was specifically composed for this year’s Festival Choir. The work’s tonal language was dense and constantly swarming, making interesting use of all different sections of the choir. This was quickly followed by an arrangement of Vaughan Williams’ English Folk Song Suite. The performance was no less effective than the standard band arrangement, with each and every line brought forth easily through the choir’s balance. Raphael Sanders then took the stage to replace Professor Estrin, and the choir continued with a charming arrangement of Jan Van Der Roost’s Rikudim, a set of Israeli folk dances in two movements. Mr. Sanders’ warm personality lent itself nicely to the piece, as he encouraged the audience to chant along with the choir itself during the rousing tune. 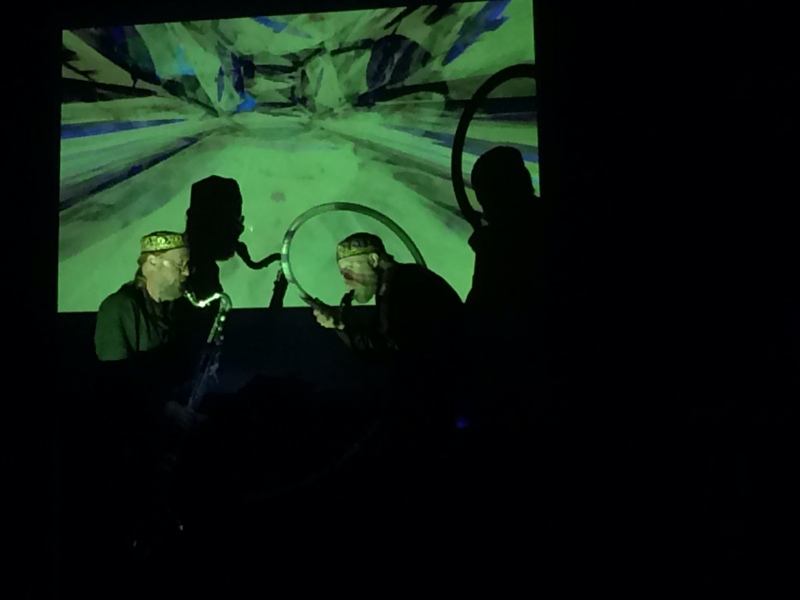 The remainder of the concert consisted of an arrangement of Bohemian Rhapsody, a Guido Six arrangement of Mugssorsky’s Night on Bald Mountain, and a spritely rendition of William Krell’s Mississippi Rag. The hard work of these choir members during ClarinetFest was very noticeable! The recital opened with a delightful performance of Alexander Grechaninov’s Sonata No. 1 for Clarinet and Piano, Op. 161 by Dmitry Perevertailenko (clarinet) and Seong Eun (Grace) Kim (piano). The work was enjoyable, oscillating between a jolly and playful nature to a more melancholy yet still comedic one. Especially beautiful was the second movement, Canzona. The third movement contained many false endings that left the audience wondering how it would close. Next up was Buffet Crampon and Vandoren Artist Alcides Rodriguez of the Atlanta Symphony. He was joined by Gail Novak at the piano performing the Widor Introduction and Rondo, which was not listed on the program. Alcides’ command of the technique was evident, as was his beautiful tone, especially at piano dynamics. His performance was extremely well received by all. Next Alcides was joined by Heather Rodriguez (Rodriguez Musical Services) for Ponchielli’s Il Covegno. Their tones blended exceptionally well and they made this tricky work seem effortless. Bravo. The recital closed with a work by Thomas Drury, Sonatina for Clarinet and Piano. 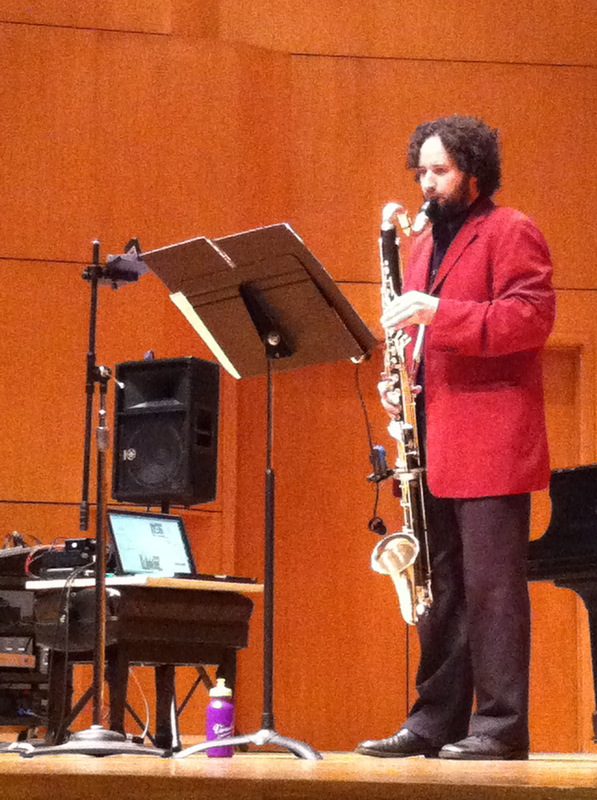 Thomas Josenhans, clarinet (Chair-University of Evansville), was joined by the composer at the piano. The first movement, “Driving but buoyant” was in ternary form and had a wonderful imitative quality. The second movement, “Quite slow but with a lilt” started with a beautiful (possibly Irish) folk song that then transformed into an anxious and dissonant section. Another three-part form, the melody returned to be performed by the piano and ending positively. The third movement was a jig that had running triplets before becoming fragmented and imitative once more. 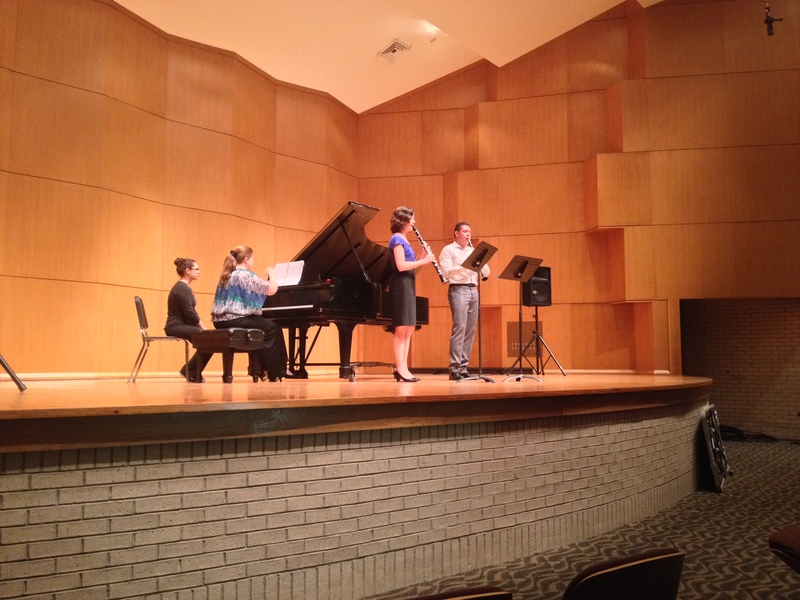 The piece was performed with enthusiasm and would work well on recitals for students and professionals alike. Dr. Lindblade is the Assistant Professor of Clarinet at the University of Central Oklahoma and is a Clinician at Clarinet Pro Workshops, Austin Texas. Ending the week of clarinet entrepreneurship was the ICA Professors Ensemble. The ensemble, led by Robert Walzel, opened the concert with the upbeat, Ronald Scott arrangement of Poco Allegro from Five Bagatelles, Op. 47 by Dvorak. Masters of their instrument, it is no surprise that these clarinetists put on a final concert that was a smashing success. The theme was light and clear, bouncing through the ensemble with ease regardless of dynamic or tessitura. 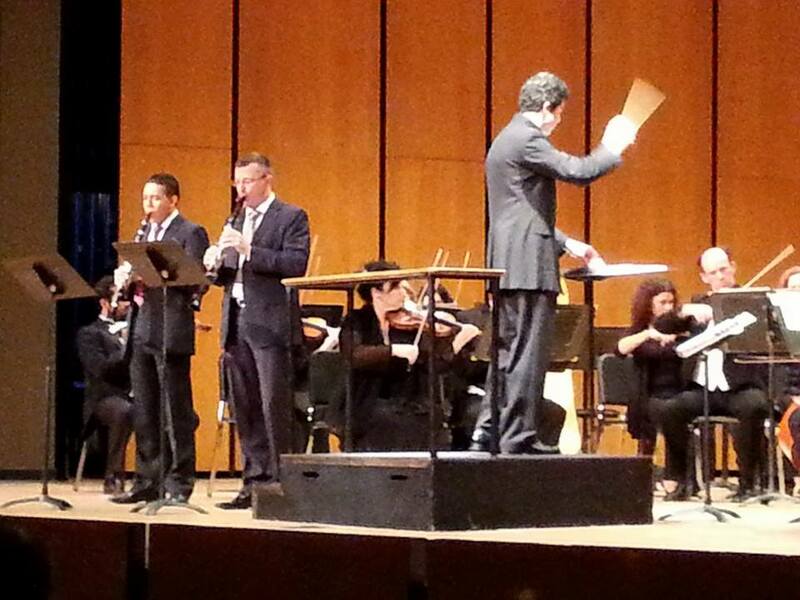 Piero Vincenti took the stage to lead the ensemble in three pieces he brought from Italy. The choir’s full sonorous sound filled the hall like a church organ during the Donizetti and Rossini arrangements by Pontini. The Klezmer rhapsody following added a wonderful color to the concert, especially in the E-flat stylings of Diane Barger who played with secure intonation and a warm tone most becoming but often absent in E-flat playing. Of all the pieces, none were as jovial and becoming as the World Premiere of Guido Six’s arrangement of Souvenir of The Piano Man: “Grenadilla Rhapsody.” Even ensemble members Larry Guy and Julia Heinen could not contain their excitement as they bobbed and jaunted in their seats to the jazzy harmonies and rhythms. The pinnacle of surprise came when an entire section played the Rhapsody in Blue solo in a roarous smear. In an effort to respect the time of the performers, the final piece (another Six arrangement) was abbreviated. Bravo Maestros Vincenti and Walzel on a superb concert! Both clarinet choirs in Sunday morning’s 8:00 a.m. Shaver Theatre performance played admirably. The Texas A&M University – Kingsville Clarinet Choir featured several lively pieces with solid solos in Everett Gates’s Seasonal Sketches by the principal clarinetist, and a beautiful feature of the front row later on. The TAMU-K Choir was professional in every aspect, down to the coordinated lifting of their instruments before beginning to play each piece. With a wide repertoire prepared, they continued with solid renditions of Bruce Ronkin’s Episode for Clarinets, Maria Theresia von Paradis’s Sicilienne, and Paul Harvey’s Jollipop. The 17 talented young clarinetists showed exuberance in their playing and demeanor, putting the fun back into clarinet choir. The Clarinet Madness Choir represented a refreshing group of 10 adult clarinetists, also running the gamut of repertoire with a wide variety of pieces. All three performed Sunday morning — William F. Funk’s Grenadille du Trisque, Henry Tucker and Louis Lambillote’s Fantasia on Two Songs: Sweet Genevieve and On This Day O Beautiful Mother, and an arrangement by Jack Knowles of Rossini’s The Barber of Seville — were written specifically for the Clarinet Madness Choir. The first piece featured both the first clarinetist and the E-flat clarinetist in solos and a charming duet. The highlight of the recital, however, was The Barber of Seville, a work frequently arranged for clarinet choir. The Clarinet Madness Choir took the piece at a lively tempo and maintained the energy for the duration of the work. A technically challenging piece to tackle, The Clarinet Madness Choir handled it well, finishing the recital with a bang. The 9:00 Sunday Lagniappe recital in the School of Music Recital Hall featured a variety of chamber ensembles, in combinations both familiar and unfamiliar. It opened with a spirited performance of four Estampas Criollas composed by Beatriz Lockhart, performed by the Quartet Atrivedo. The clarinet quartet played the lilting rhythms of these charming dances with admirable energy, syncopations and cross-rhythms shimmying away under sweet lyrical melodies. This was an altogether enjoyable performance, carried off with panache and style by the four artists: Allison Allum, Emily Kerski, and Mando Ramirez on clarinets and Asa Graf on bass clarinet. The second group to perform was a wind trio from The University of Tennessee-Martin, an unusual trio of flute, played by Charles Lewis; clarinet, played by Elizabeth Aleksander; and saxophone, played by Doug Owens. The group performed seven short movements by Paul Harvey with charm and grace. The group balanced the three voices beautifully, so that each of the instruments could be clearly heard, and some lovely timbral blends emerged. The Incantation movement, which featured Lewis on alto flute, was especially notable. While each of the players had a chance to step into the spotlight with lovely melodies, the most notable feature of this performance was the wonderfully balanced chamber aesthetic demonstrated by this accomplished ensemble. The final selection on the program was I Never Saw Another Butterfly, a duo for soprano voice and clarinet by Lori Laitman, performed by Laura Storm and Steven Becraft of Henderson State University. Storm explained that the texts are from a collection of poems written by children interred in German concentration camps during World War II, but she noted that in spite of their tragic circumstances, many of the poems are full of life and joy. Storm declaimed the texts clearly, with a rich, velvety vocal tone, matched by Becraft with a sound that was focused and warm in all its registers. The songs evoked a variety of moods, from the dance-like Yes, That’s The Way Things Are to the ominous quality of The Old House. Lighter moments, as in Birdsong, where the two voices were braided together in their high register, contrasted with darker ones, like the low bell-like tones and static vocal line that opened the final song. Becraft and Storm brought riveting drama to this powerful set of songs, bringing the concert to a contemplative close. 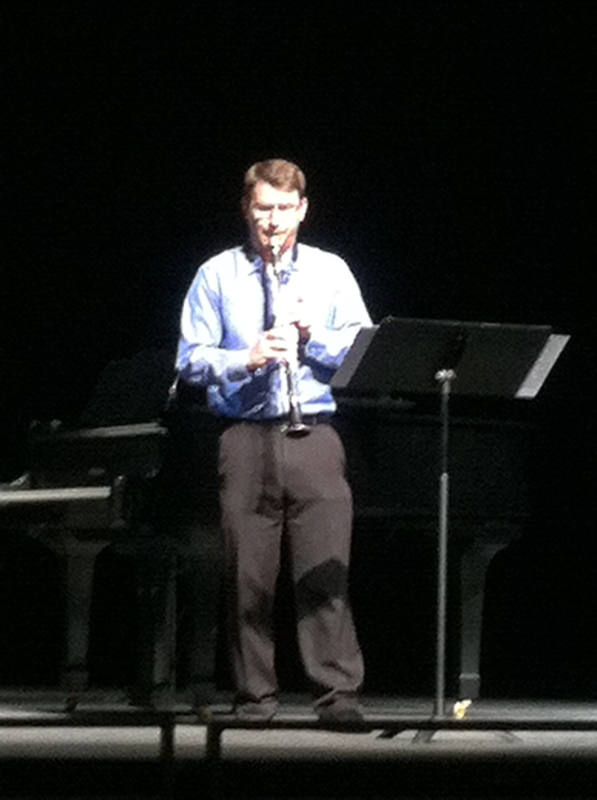 Michael Rowlett is the assistant Professor of Clarinet at The University of Mississippi. You can find his CD Close to Home: Music of American Composers on Amazon and Albany Records. On the final evening at ClarinetFest 2014, we enjoyed incredible works for clarinet and orchestra. Alcides Rodriguez and Gabor Varga give a jovial opening to the concert playing Krommer’s Concerto for Two Clarinets and Orchestra, Op. 35. With bubbling lines and a beautiful blend, the duo played with poise and grace. The two clarinetists displayed great sensitivity to throughout the second movement, playing with great control and intonation over a subdued Baton Rouge Symphony Orchestra. Following was Ralph Skiano with his poignant interpretation of Debussy’s Premiere Rhapsodie. The clarinet weaved its way in and around the orchestra with incredible ease, wafting through elongated phrases and impish flourishes. In these moments the interplay between soloist and and the orchestra’s principal winds was delightful, particularly with the oboist. Taking the stage, Greg Raden performed Weber’s Concerto No. 1. His first note stilled the room with his pure sound floating high above the orchestra. The third movement was lively with delicate inflections and a variety of colors which made for a lovely contrast between themes. Antonio Saiote gave a lively performance of Canongia’s Clarinet Concert No. 3 in E-flat. With wild technical demands, Saiote took command of the stage and played with abandon. Taking some artistic license, his virtuosic performance of Canongia’s work was a memorable performance from the night. In a last-minute change of performers, Robert DiLutis took the stage instead of the programmed David Drosinos to perform Ben-Haim’s Pastoral Variee for Clarinet, Harp and Strings. A consummate professional and profound musician, none would have assumed he was not the originally programmed artist. In many respects, it was the most impressive performance of the evening. A full, lush string section cued the start of Mozart’s Clarinet Concerto, and the final piece of the evening. Paul Cigan delivered an inspiring performance of our cornerstone work. His pianos seemed to draw you in, peering into intimate moments of repose.